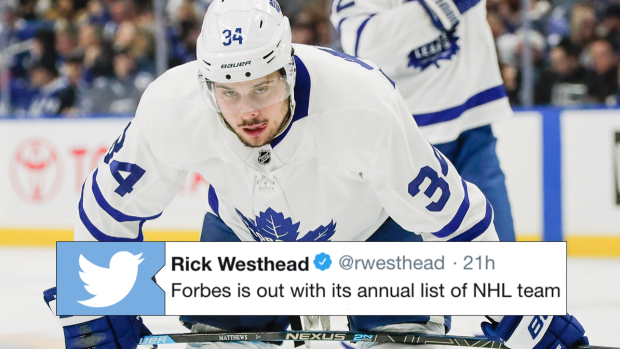 On Wednesday, Forbes released a couple of lists centred around the NHL and money with their annual list of hockey's most valuable teams. By our (and Forbes') calculations, this is the 4th-straight year the New York Rangers top the list, but the thing we wanted to focus on was where the Golden Knights were at after their first season in the NHL. Vegas had an incredible inaugural season in which they made it to the Stanley Cup Final and their on-ice success certainly translated to off-ice success, too. Las Vegas Knights generated $180M in revenue in the past year, 10th most in the NHL, and recorded $53M in profit, fifth highest of 31 teams. Knights now worth $575M, 15% more than their expansion fee. Those are some crazy numbers, especially just after one season. For anyone that still thinks Vegas isn't a hockey city, these numbers should further put that argument to bed. As far as the least valuable teams go, there's only one Canadian team in the bottom five and it's arguably the best Canadian team. Be sure to check out the full list here!